Leadership and management can be very depleting. When I’m tired I don’t always seem to have it in me to be patient and generous. I make a quick decision instead of empowering, solve the problem instead of showing someone how, choose to do it myself rather than take the moment to delegate effectively. In my experience, however, these seemingly quicker and easier approaches make it much harder in the long-term to lead our people and organisations effectively. Despite our good intentions, over time we lose our people’s respect, trust, and commitment altogether. As leaders, is it possible to be both strong and caring, decisive and helping, directive and resourcing? Both a leader and a humble servant? Experience tells us that selfless service is empowering and enabling. It engages the human spirit and elicits from us the very best we have to offer. It is therefore not surprising that Servant Leadership is one of the most attractive, compelling, and enduring leadership models of all time. It is said that in servant leadership we descend into greatness. Although Robert K. Greenleaf is credited with coining the term servant leadership in 1970, the concept of servant leadership is not new; it’s been latent in the human soul forever and there have been many incredible servant leaders throughout history. 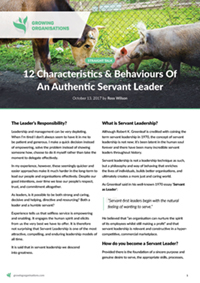 Servant leadership is not a leadership technique as such, but a philosophy and way of behaving that enriches the lives of individuals, builds better organisations, and ultimately creates a more just and caring world. He believed that “an organisation can nurture the spirit of its employees whilst still making a profit” and that servant leadership is relevant and constructive in a hyper-competitive, commercial marketplace. How do you become a Servant Leader? Provided there is the foundation of a sincere purpose and genuine desire to serve, the appropriate skills, processes, and tools which make a servant leader increasingly effective can be developed and used in the service of others. The intermediary step, however, is choice. Makes the choice to focus on the good of others first. Mucks in on the ‘dirty work’ when needed by the team. Values and strives to understand others: their world view, strengths, feelings, and aspirations. Adapts his own communication style to meet the needs and expectations of the other person. A lifelong learner who strives to become a better leader and a better person. Shapes the present in light of a better future. Raises and extends others’ line of vision – Looks beyond the day-to-day and provides direction and raises hope. Helps people find their home in the community of their colleagues. Identifies and enlists their talents. Provides opportunities for connection and contribution. Delegates authority rather than using authority. To gain commitment rather than simply convincing to achieve compliance. Builds consensus. Negotiates on consistent principles and interests rather than positions. Stays ahead of what’s happening around. Evaluates decisions and possible consequences; considers unintended consequences. Grows ever wiser from experiential learning. Open to feedback and willing to change. Manages emotions. Consistent in actions and morality. True to the principles of leadership they espouse. Allows intuition to influence decisions. Does quality analysis. Understands situations and people at a greater depth. Discerns motives and character. Accepts responsibility. Considers and plans for the good of all stakeholders – individual, team, organisation, customers, partners, community, and society as a whole. Holds employees accountable for their commitments and values-based behaviour. Encourages enhanced moral reasoning among followers. Forgives offence and failure. Relates to others as whole persons mentally, physically, emotionally, socially, and spiritually. Cares about whole lives not just job role. Serves followers for their own good as well as the good of the organisation. Diligently demonstrates personal integrity. Encourages initiative, entrepreneurship, and learning. Develops leadership capability in people and throughout the organisation. Thinks long-term – next generation, next leader. Cultivates a culture of authentic acceptance, respect, trust, safety, and security. Upholds high moral and ethical standards throughout the organisation while encouraging freedom of expression within clear boundaries. 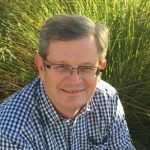 Sources: Robert Greenleaf, Greenleaf Centre for Servant Leadership, Dirk van Dierendonck Literature review, the research of Robert C. Liden, Larry C. Spears. List adapted from “Character and Servant Leadership: 10 Characteristics of Effective, Caring Leaders” by Larry C. Spears, published in “The Journal of Virtues and Leadership,” Vol. 1, Issue 1. Reproduced with permission.